It seems that only Xiaomi is able to buy all the flagship Qualcomm processors of the new generation. Judge for yourself: Snapdragon 855 is used in Mi Mix 3 with support for 5G networks, the same platform is attributed to the new full-fledged flagship Mi 9 and the budget flagship Pocophone F2. Finally, the new generation Black Shark gaming smartphone will also have Snapdragon 855 – this follows from the Geekbench test. 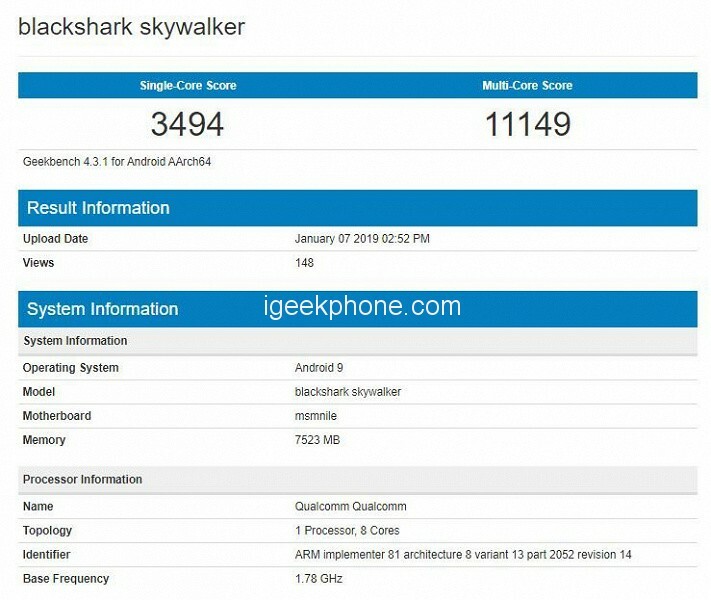 The smartphone appears under the code black shark skywalker, but the product name will be different. For example, Black Shark 3 or Black Shark Helo 2. Apparently, the device is based on SoC is the code name for the Snapdragon platform 855. Benchmark performance results are 3494 points in a single-threaded test and 11149 points in a multi-threaded test – about the same The Geekbench result showed an engineering sample on the SoC Qualcomm Snapdragon 855 a few days ago. You can see that the new Black Shark has received 8GB of RAM and Android OS 9.0 Pie. Although for sure the company will offer a version with 10GB, like the Black Shark 2. The Qualcomm Snapdragon 855 chip is based on the 7nm process and supports 5G baseband. It is also the first commercial platform to support Multi-Gigabit 5G connection, with the Snapdragon X50 5G Modem. Equipped with a fourth-generation AI engine, the first dedicated NPU is integrated into the SoC, providing three times the combined performance of the previous generation Snapdragon 845 processor platform. A new generation of processors can be optimized for gaming, artificial intelligence, and photographic algorithms. Xiaomi Black Shark Skywalker is reported that the opportunity will be released around March.